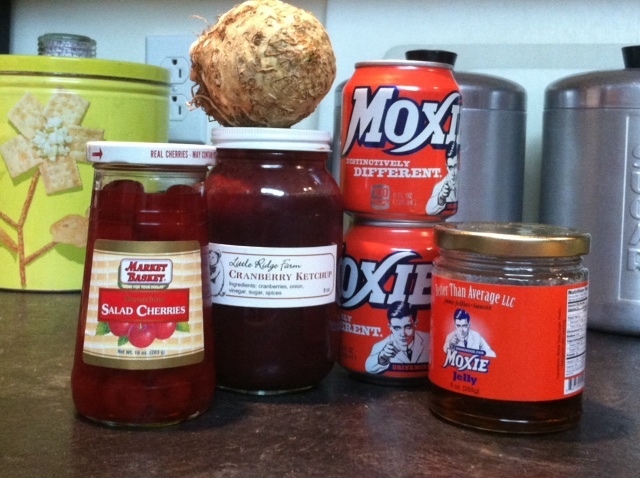 This week, I started working in earnest on the details for the Moxie Recipe Contest. Some of my newer readers may not know this, but last year I “hosted” a cooking contest during the Moxie Festival in Lisbon Falls. Excitement, food, new friends, all stirred up with a splash (or a gallon) of Moxie soda. We had fabulous prizes, celebrity judges, and swag bags for entrants. I was even on Tee Vee! It was so exciting that I’ve actually been dreading this year’s contest. What if it falls short of last year’s thrill-a-minute food fest? OF COURSE there will be wonderful prizes to win again (like an orange Cuisinart immersion hand blender or two)! Yes, and celebrity judges! Swag bags? But of course. New this year, ribbons for the winners. But what certain something or special twist will make the contest new and fresh? My first brainstorm, given that I’m an apron-loving throwback to another time was “Mid-century Moxie.” “Mid-century modern” is a term that applies to architecture, products, and the zeitgeist of the middle of the last century (including the 50’s). The Atomic Age, baby! By extension, it could include the food of suburbia. After the privation of World War II, Americans moved into the suburbs and cut loose. Their desire for convenience lead to casseroles, grilled nibbles on a stick, and inventive main dishes fortified by crushed breakfast cereal, Lipton onion soup mix, and Jell-O. The Moxie Recipe Contest could be a showcase for cooks to create recipes that captured the Mid-century modern flavor and spirit. The Moxie Recipe Contest will be held on Friday evening, July 11, 2014, at Chummy’s Restaurant in Lisbon Falls, Maine. The judging begins at 5:00 p.m. This entry was posted in You've Got Moxie! and tagged "Chopped", Chummy, leave me a comment with your ideas, Mid-century modern, The Moxie Festival Recipe Contest. Bookmark the permalink. Damn, I think I just gave away my winning recipe. Hey, what about Moxie in mixed alcoholic drinks? Now there would be a winning category, and a good time had by all! Ahem…there might be some liability issues, Reggie. But by all means, test Moxie mixed drinks in the comfort and safety of your manor. I think last year is still too new to be old. Thank you for that perspective, Faye. I’m interested in having a “people’s choice” judging, though, to allow more people to taste the recipes. Stay tuned. Whatever you decide, let me know at Contest Cook!